The hills around Denver, Colorado were alive with music, but not with the voices of the von Trapp family. This music emanates from the humming engines of Audi’s eighth version of their ‘B’ Segment lineup – the Audi A4, S4, A5, S5 and, again, the Audi allroad. 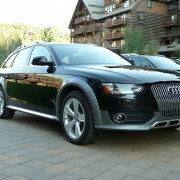 For 2013, Audi reintroduces the allroad, last available in the US in 2005. This new version replaces the A4 Avant in Audi’s model line. Now based on the A4 platform rather than the A6, the new allroad is faster and more energy efficient than its predecessor. A 211 horsepower, 2.0-liter, direct-injection I4, turbocharged engine provides plenty of oomph to tackle the Rockies while still delivering 23 (combined) mpg. 258 lb.-ft. of torque are generated at 1500 rpm. Audi links the 2.0T motor with an eight –speed Tiptronic automatic transmission. A manual transmission is not currently available. We tested quattro, Audi’s permanent all-wheel drive system, when afternoon thunderstorms all but obliterated the roadway. Grip on the slick, mountain curves never wavered on the standard 18-inch wheels shod with 245/45 all season tires. 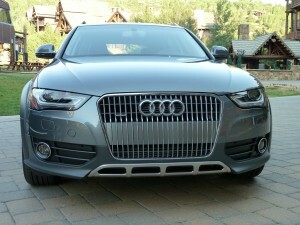 The 2013 allroad receives the distinctive Audi “Singleframe” grille with vertical chrome struts and angled upper corners. That feature appears also on all ‘B’ Segment cars for a homogeneous look. Newly designed headlamps, fog lamps, side mirrors, taillights, and exhaust add to the fresh appearance. 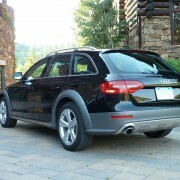 The new allroad’s longer wheelbase adds ride comfort and an additional 1.5 inches of ground clearance. That and a widened track makes off road trekking a little easier. Body cladding, traditionally a matte finished gray/black is also available in full paint finish. 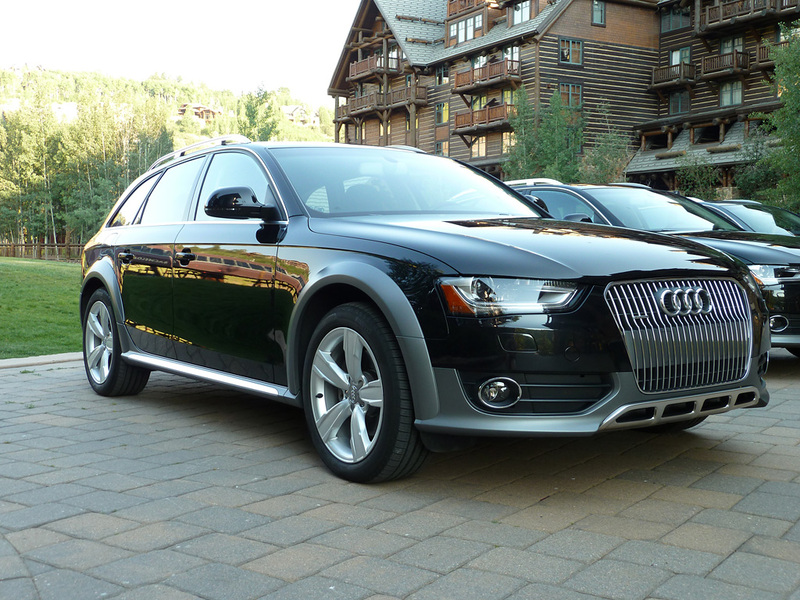 Technology abounds in the 2013 allroad. If you are travelling at less than 19 mph, the Audi Adaptive Cruise Control system can fully stop the car if it senses a collision. 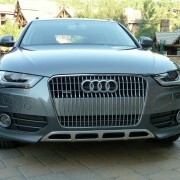 An electromechanical power steering system, Audi Dynamic Steering, replaces a traditional hydraulic system. It requires no additional energy from the engine, if it is travelling in a straight line, and thereby reduces emissions. Factory installed wireless internet, called Audi Connect, a 3G online connection, is now available on the allroad as well as all ‘B’ Segment models. Paired with Audi’s MMI Navigation, Google Earth maps will be joined in 2013 with Google’s street view technology. While you’re busy looking at the mountain scenery, your tech-obsessed passengers can take full advantage of their electronic toys. Your allroad is now a Wi-Fi hotspot capable of connecting up to 8 devices. Who said the hills aren’t alive with music, and games, and movies, and texting? Despite the fact that the 2013 allroad is now based on the smaller A4 platform, overall height increases by 2.3 inches offering more front passenger headroom than in previous models. Driver seat memory, heated front seats, a panorama sunroof, and an available sports interior package welcome passengers. The revised instrument cluster looks modern and crisp. Fold down the 40/60 split rear seat and load the 50.5 cu. ft. of cargo space with everything you need for your mountain adventure. Interior design is sophisticated and refined. Standard leather seating alone puts allroad ahead of its rivals, notably the BMX 328i xDrive and the larger Volvo XC70. 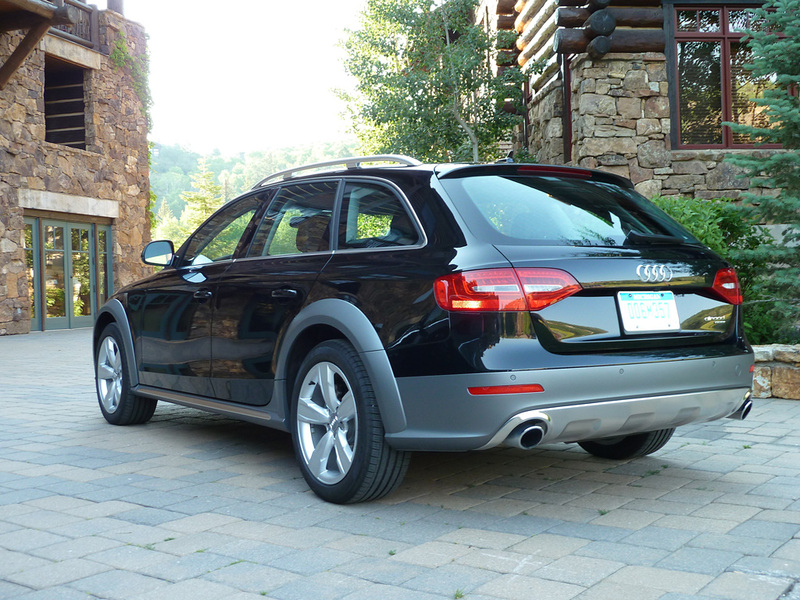 Three trim levels of the 2013 allroad are available: the Premium starting at $39,600, the Premium Plus starting at $42,900, and the Prestige model at $48,800. 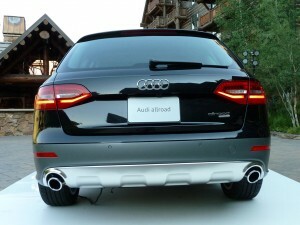 Because the 2013 allroad has few competitors in the market, Audi is betting the American public is again ready for this revised version. As an alternative to the crossover or small SUV, the Audi should appeal to anyone needing a little extra space without compromising handling and comfort. The hills may not be alive with “Do-Re-Mi” but maybe with a little Zac Brown Band, or Black-Eyed Peas, or the sweet sound of a 2.0T motor humming up a mountain pass.